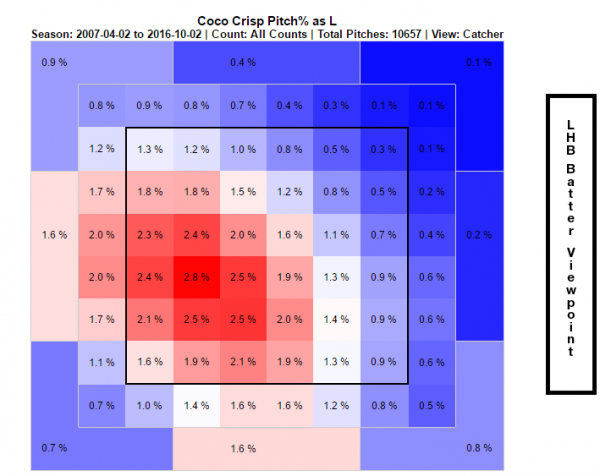 To find Crisp’s last hit by pitch, you have to go all the way back to May 9, 2011 — which, for Crisp, was 2,724 plate appearances ago. He’s been something just less than a full-time player over that span and he hasn’t been hit once. For context, were a batter to get hit at a league-average rate over that time period, you would expecting something like 24 HBP. The player who’s amassed the second-longest stretch since Crisp’s last HBP is Nick Punto at 862 plate appearances. Sure, there are players who’ve been hit merely a few times during that span — meaning their cases aren’t really much different from Crisp’s — but if you’re interested in the zeros, he’s in a class by himself. The zero itself might be the product of variance, but not getting hit is certainly part of Crisp’s profile. He’s been hit just five times in a career spanning 6,627 PA. In terms of HBP per PA, Crisp has the 23rd-lowest mark since 1901 among players who’ve recorded at least 2,000 career PA.
As an initial caveat, I should note that Crisp is a switch-hitter, meaning he has the platoon advantage during all of his plate appearances. Hit by pitches are more frequent per plate appearance when the pitcher has the platoon advantage (1.07% versus 0.74% of plate appearances), so you would expect Crisp to have a slightly lower HBP rate than a typical hitter, all else equal. But obviously Crisp’s mark is much lower than average so he remains an interesting case. In the context of hit-by-pitch streak, every Crisp plate appearance becomes an event. If and when a pitcher hits him next, Crisp will vanish from the hasn’t-been-hit-in-forever leaderboard, forced to start all over from the beginning. The streak could vanish on Opening Day or he could retire with it intact. News could be made at any moment. 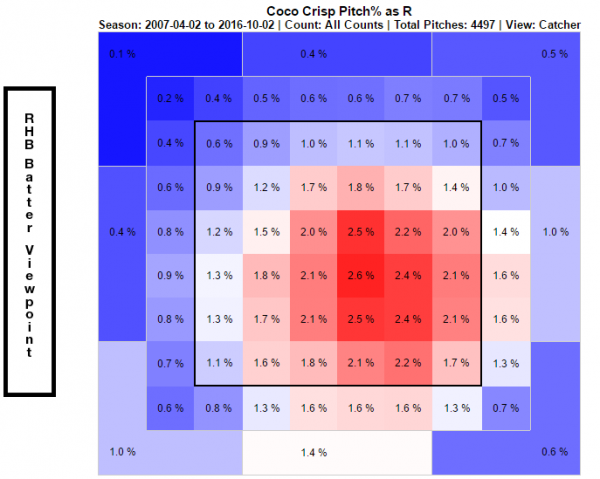 In preparation for this season’s Coco Crisp viewing parties (really, no one? ), I have prepared a look at some of the near misses in recent years. There’s no exact method for finding these cases, as some of it depends on where he stands and how the pitch moves, but I’ve used PITCHf/x to isolate a few cases where the ball crossed the plate in the general area where a person would be standing and have then reviewed the tape to bring you these examples. Given the unlikeliness of his streak, it makes sense to wonder what’s unique to Crisp. His main quirk is probably how he buries his chin into his front shoulder. Perhaps there’s something about his stance that gives him an early warning? As we saw in the Dietrich piece last week, some hitters use that awareness to get hit more often. Perhaps Crisp has elected to use his vision in the opposite way? No one would blame Crisp if he chose not to lean in and risk injury. Cleveland didn’t pick up Crisp’s 2017 option, so we still don’t know where he’ll be playing this year. It makes sense that the club didn’t want him for $13 million, but there’s definitely still potential for him as a role player for plenty of teams. He still has decent command of the zone and some moderate power. He’s not going to be an asset in the field, but a team looking for an experienced player who can split time between corner outfield and DH could do a lot worse than Crisp, even if his main draw at this point is his remarkable ability to never get hit. We hoped you liked reading The Man Who Hasn’t Been Hit in Almost Six Years by Neil Weinberg! Bravo, Neil, you dirty dog!